There may be no one perfect calendar. Everyone has their own favourite method for keeping a schedule. Some of us are beholden to Microsoft Outlook, a hub containing our emails and calendar that can be expanded and improved with third-party plug-ins. Others perhaps rely on Google Calendar, the online app that syncs with our phones and tablets and all the other devices we might need to look up information with. Some people might even continue to rely on the old-fashioned pen and paper personal planner. When it comes right down to it, we want our schedule to help us remember where we have to be at what time, and who else will be there with us. Menlo Park, Calif.-based Tempo AI has created an iOS app that delivers that, plus all the details you could ever want to know about who you’re meeting with, thanks to some fancy combinations of social network connections and machine learning. Tempo’s app has some handy features that might seem familiar to other personal assistant apps, such as Google Now. It offers details on the flight numbers you put in your calendar, the option to text someone a pre-written message if you’re running late, and connects you to related emails and documents ahead of the meeting. A new feature, called Tempo Insights, launched last week and updated March 11, delves into social media channels and other directories to bring you relevant details about the person you’re meeting with. 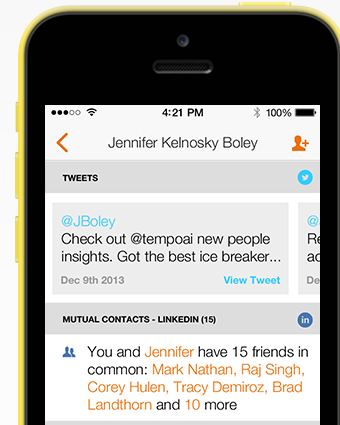 Tempo scans social media for relevant details about someone you’re meeting with. So if you’re meeting with Bob, Tempo will scour Twitter, LinkedIn, CrunchBase, Google+, Klout, Flickr, About.me, Facebook, Foursquare, AngelList, and Meetup for any information relating to Bob. That way you can see what Bob’s talking about lately, be reminded of any conversations you’ve had with him, and see if you share some common contacts. It’s a great way to get your foot in the door, as Temp says. The app is free, and after being reviewed more than 2,000 times on the App Store, it has an average rating of 3.5 stars.